Each year, millions of birds make arduous journeys spanning thousands of kilometres—from the locations where they breed and raise their young to areas where they spend the harsher seasons. 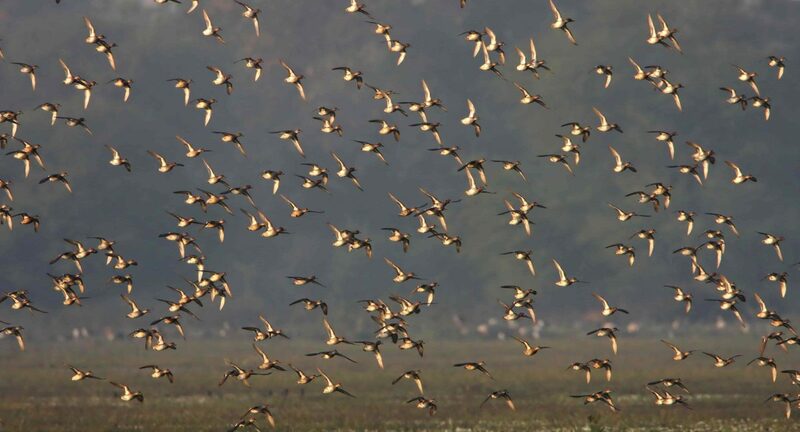 India alone plays host to an estimated hundred species of migratory birds, who cover incredibly long distances to escape the severe winters of their native habitat. We take a closer look at this annual phenomenon. If you are an avid bird watcher from a tropical country like India, winter has to be your favourite season. This is the time when migratory birds, some in flocks of millions, reach India from the northern extremities of their ranges. Year after year, these birds return to the same places, including individuals that are travelling for the very first time, the maps etched into their genes. It is a known fact that birds evolved from reptiles, roughly 150 million years ago. The conversion of scales into feathers allowed these creatures to take to the air. Once airborne, there were endless possibilities. Birds could now escape from land predators, catch prey in the skies, colonise new places faster than land-based animals and, most importantly, escape an unwanted situation or condition, only to return when the season turns favourable. Bird migration has been known to humans for more than 3,000 years, since the time ancient Greek scholars, Homer and Aristotle, have written about it. But it is only recently, with the aid of modern technology, that we have begun understanding how fascinating and how intricate these journeys are. Most birds migrate in the north-south direction, spending the summer of the northern hemisphere in the upper limits of the ranges and then travelling south to escape the bitter winters. The shorter days indicate to the birds that winters are approaching and that they have to leave soon. For most, this northern limit of their range is also their breeding ground. So, for the offspring born this year, it would be their very experience of this marathon journey. Several young ones travel along with their parents, understanding and learning the path by heart during their first expedition. In the very next year, these young birds would be ready to undertake the journey by themselves. Arguably the most well-known of all winter migrants are the waders or the shorebirds. Some wading birds are known to travel more than several thousand kilometres to reach their wintering grounds. Just before they migrate, these birds show a noticeable change in behaviour; they collect in remarkable numbers and display something known as migratory restlessness or ‘zugunruhe’. 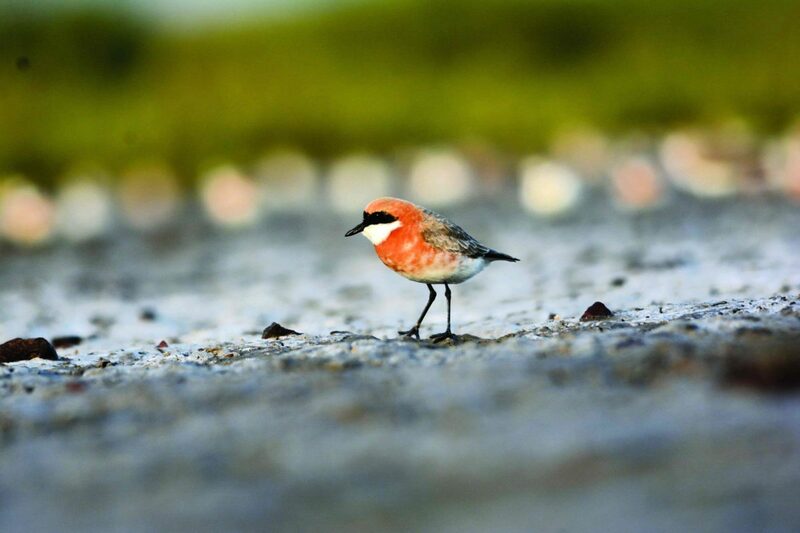 Most shorebirds have small, compact bodies, but long and pointed wings – a useful aid for flying long distances. Their pocket-sized bodies are not great for storing large quantities of fat reserves, and thus the wading birds are forced to take refuelling pit stops on their journey. While several waders, like Greater (Charadrius leschenaultii) and Lesser (C. mongolus) Sand Plovers, Terek Sandpiper (Xenus cinerus), Sanderling (Calidris alba), Ruddy Turnstone (Arenaria interpres), etc., are specialists of coastal areas, others, like Tringa sandpipers, Kentish Plover (Charadrius alexandrines), Ruff (Philomachus pugnax), Stints (Calidris sps. ), etc are generalists and can spend their winters along coastal banks as well freshwater bodies. Nevertheless, wherever they decide to spend their winters, shorebirds are known to form some impressive congregations, sometimes huddling up in thousands. But waders are not the only birds known to form spectacular gatherings. The Demoiselle Crane (Grus virgo) migrates from central Asian countries such as Kazakhstan and Mongolia, using the Central Asian Flyway, and winters in the Indian subcontinent. 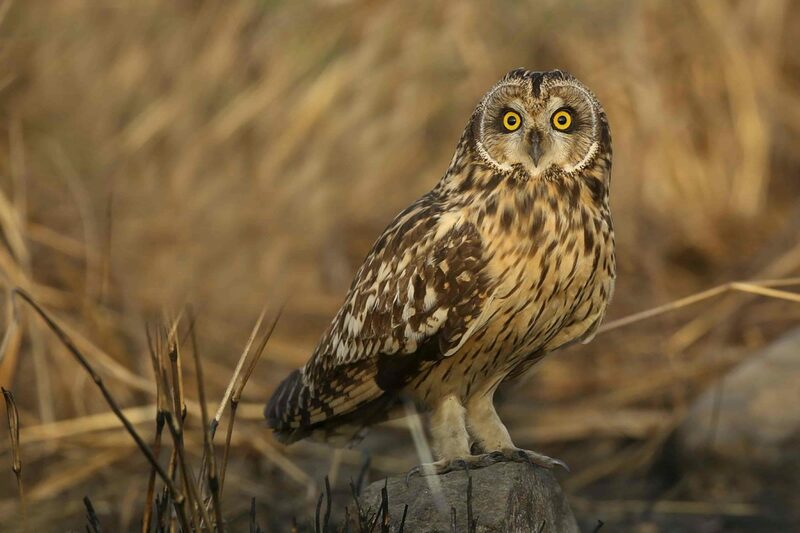 It is a widespread visitor in India, but certain spots see them gather in huge numbers. One such place is Khichan in Rajasthan, where the birds crowd to feed on surplus grains generously left by the farmers. Another fabulous story of great congregations is that of the Rosy Starling (Pastor roseus). Travelling from Eastern Europe and western-central Asia, Rosy Starlings visit in such great numbers that in certain wintering hotspots their population exceeds the resident starlings and mynas by a few hundred to one! As they take to air, the Rosy Starlings also perform some of the most stunning synchronised acrobatic aerial displays. 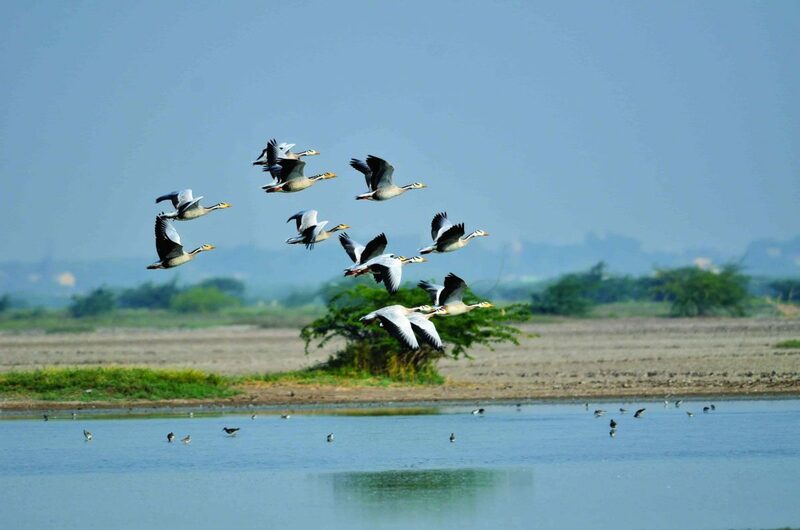 Taking the Central Asian Flyway, another group of aquatic birds also visits the Indian subcontinent from their breeding ground in Central Asia – the waterfowl. Once again, the urge to migrate is triggered by the changing photoperiod – days getting shorter and nights longer. This change in the environment triggers a hormonal change in the birds: the body begins to accumulate fat and the plumage also undergoes a dramatic moulting. Both these changes are absolutely important for the waterfowl, as these birds make the journey nonstop. Flying day and night for up to five days, the birds are guided by the sun during the day and stars during the night. So exhaustive are these marathon journeys that by the end of it, the birds would have lost more than half of their body weight. One of the major obstacles that stand in the way of the birds taking the Central Asian Flyway is the long chain of mountains known as the Himalayas. Most birds prefer to navigate through the valleys of the tall mountains, but this is a gamble. Great aerial predators patrol the mountainside and make easy meals out of the exhausted birds. There is one bird, however, that literally rises above the situation. While crossing the mountains, the Bar-headed Goose (Anser indicus) flies over the tall Himalayan Mountains, fighting the extreme cold and thin air, to reach their wintering grounds in peninsular India. Once recorded as flying at an altitude of 8,481m, over the fifth tallest mountain in the world, the Bar-headed Goose holds the title of the highest flying bird in the world. Flying nonstop for days is a tiring business. Not all birds can do this. Raptors, being heavy, prefer to glide. Rising on the thermals – upward moving currents of warm air, raptors gain height and then glide for long distances looking for the next thermal to catch. Thermals are caused because the sun heats up the land, warming the air close it, which being lighter rises up. As a result, thermals are not created in the night and raptors are forced to take breaks, thus lengthening the duration of their travel. Once again, most raptors coming to India travel from Eurasia and thus use the Central Asian Flyway to reach the Indian subcontinent. Although raptors are generally solitary birds, they can congregate in one place during the winters, when the pressures of raising young ones are absent. Wintering harriers (Circus sps.) assemble in thousands at Velavadar in Gujarat, making it the largest roosting site for harriers in the world! Being a tropical country, India does not get many summer migrants from other countries. But the southwest monsoon season in peninsular India, which is also a part of the extended summer, does create a season of plentiful. And there are birds which take advantage of this bounty. Riding on the southwest monsoon winds, the Jacobin Cuckoo (Clamator jacobinus) arrives in India at the onset of the monsoon to breed. This migration has been keenly observed for a long time in India and the cuckoo has been labelled as the harbinger of monsoons in India. Similarly, the Oriental Dwarf Kingfisher (Ceyx erithaca) makes an appearance in the forests of the north-eastern part of the country and in the northern Western Ghats at the start of the monsoon to breed, only to disappear when the rains go away. It is believed that the kingfishers visiting the northern Western Ghats come from the southern Western Ghats or possible even Sri Lanka, but the migratory patterns of this bird are still not understood. India, being a vast and geographically varied country, houses several different types of habitats –and thus, there are many birds which migrate within the boundaries of India. There are several species which breed in the Himalayas in summers and then travel the length of the country to spend the winters in the south. Warblers and flycatchers are popular among the birds which do this, and the Kashmir Flycatcher (Ficedula subrubra) is probably the best example. As the name suggests, the bird breeds in the north-western Himalayas and then journeys to the southern Western Ghats and Sri Lanka to avoid the freezing winters in the mountains. There are many birds which make the journey to the south from northeast India as well, at the same time and for the same reason. Similarly, the Eurasian Golden Oriole (Oriolus oriolus) and Asian Paradise-flycatcher (Terpsiphone paradisi) migrate between north and south India depending on the season. But in several locations, especially closer to the southern end of their ranges, there are populations of the species which do not migrate at all. Conditions here, mainly temperatures and food supply, remain more or less constant and hence there is no necessity to move at all. 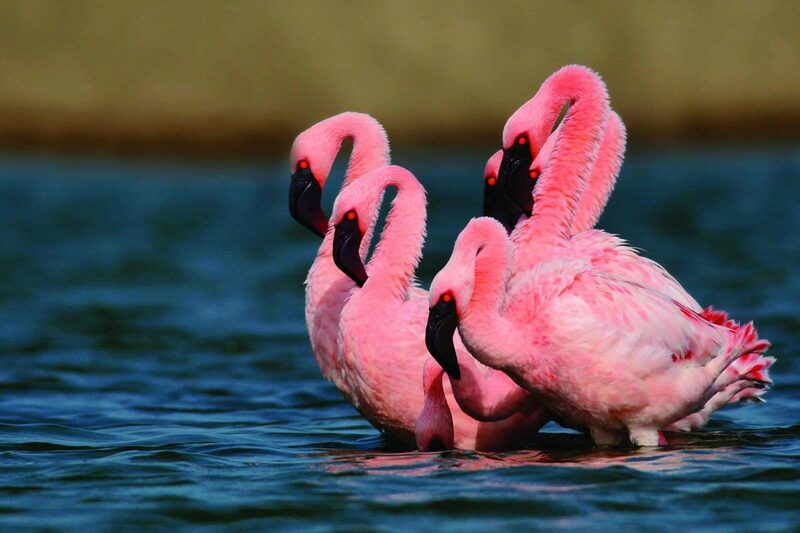 For the flamingos of India, both Greater (Phoenicopterus roseus) and Lesser (P. minor), the situation is reversed. While there are several places in the country where the flamingos can survive, there is just one place where they can raise their young. Thus, the whole population of flamingos in India, wintering at several different locations, converges in Kutch to breed during the summers. But not all domestic journeys are such long-distance ones. Birds living on high mountains just need to travel down to escape the harsh winters of higher altitudes. Such local migration is known as altitudinal migration. Several residential birds of the Himalayas are known to do this. The Himalayan Vulture (Gyps himalayensis) travels as far south as central India from its breeding grounds in the Himalayan mountains while looking for warmer places at lower altitudes. Human activities have threatened migratory bird species and their migrating paths in several ways. Climate change has disrupted weather patterns and exploding human populations have encroached on ancient migrating paths. Long distance migration paths consistently cross political boundaries, and international cooperation, which becomes absolutely essential for the conservation of such species, is not always established. Migrating birds assemble in huge numbers, which can also become a threat for the species as it becomes extremely easy to hunt them. Passenger Pigeons (Ectopistes migratorius) were said to amass in billions while migrating, the flocks would spread over a mile and a half in width and approximately 300 miles in length, which sadly became the very reason for the bird’s extinction. Hunting along migration routes, especially in Afghanistan, highly impeded the Siberian Crane’s (Grus leucogeranus) journey to India, before the central population became completely extinct. Similar fate would have awaited the beautiful Amur Falcon (Falco amurensis) had a timely intervention not been staged, which led to the ban put on the hunting of the bird in Nagaland, where the migrating birds rest in thousands en route their long journey from Russia to South Africa. Although seemingly random, migrating birds actually fol­low some strict paths while migrating. These flight paths are called ‘flyways’. Flyways are huge and can span over continents and even oceans. Eurasian and Siberian birds, moving to the south for winters, take one or a combination of multiple flyways to reach Africa, South Asia, South-east Asia or Oceania. The Central Asian Flyway (CAF) is the most commonly used flyway by birds migrating to India. The northern catchment area (breeding grounds for several waterfowl) of the CAF overlaps the two other flyways, viz. West Asian-East African and East Asian-Aus­tralian Flyways. For birds taking this flyway, the destination is either the Indian subcontinent or the islands in the Indian Ocean. Spreading over 30 countries, the flyway is used by about 182 species of just waterbirds, along with a few other species which are not dependant on water.